Kids love finger foods! OK, OK, so do grown-ups! It was pizza night the other night and I decided to try something new. It was getting late and I wasn’t in the mood to make a big meal. 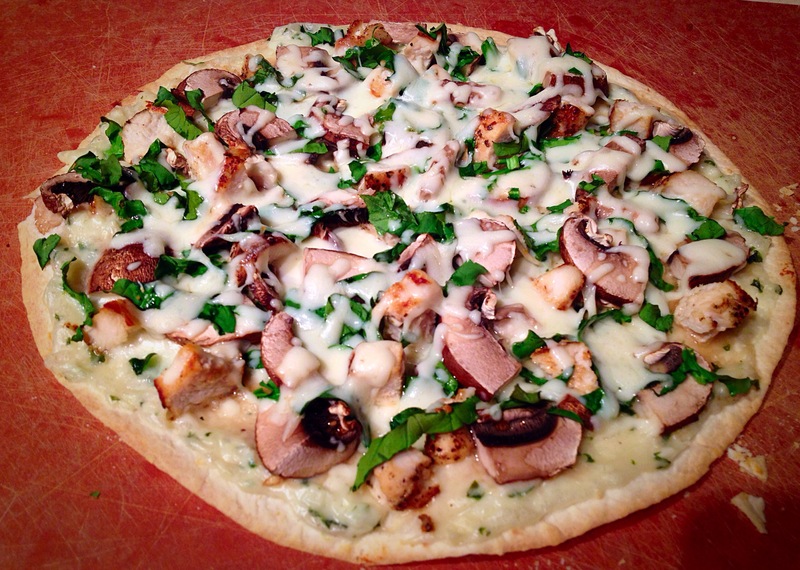 Open the tube of pizza dough and roll it out to 1/8″ thick and cut it into 10 equal pieces. Place 4 slices of pepperoni on each piece of dough. Top with a cheese string. Squeeze a line of pizza sauce on top. Stretch the dough over the stack and seal the edges with your fingers. Place the rolls on the prepared baking sheet. 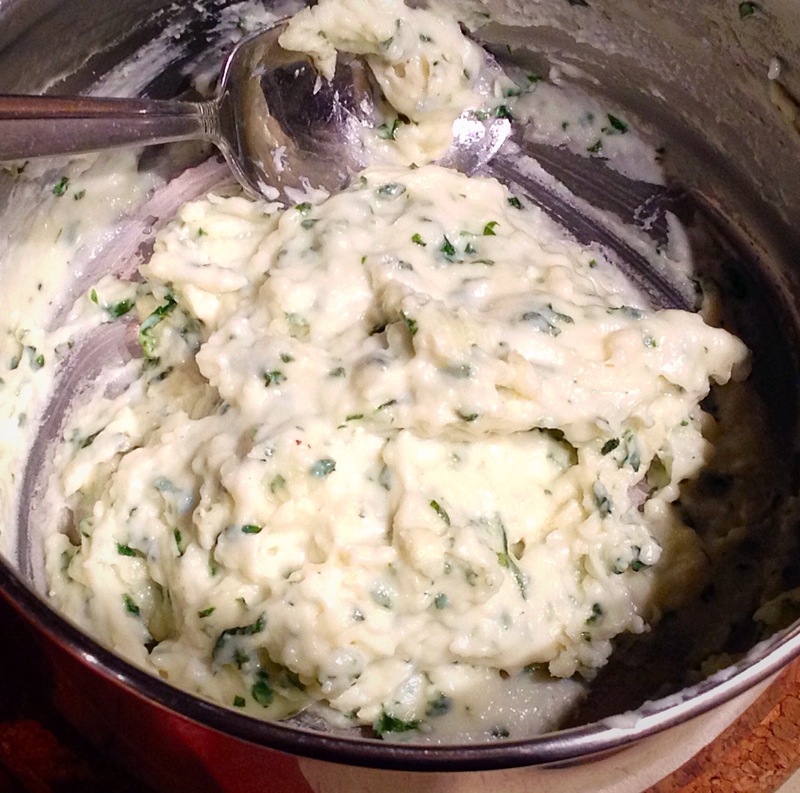 Melt the butter, add garlic powder and basil, and stir to combine. Brush the tops of each roll with the butter mixture. Place the baking sheet into the preheated oven and bake for 10-12 minutes. Remove from oven, let cool for a couple minutes, serve and enjoy! * you can use any toppings that you like to fill these. Try Hawaiian, peppers, olives or mushrooms. Just make sure the pieces are cut small and they aren’t over-filled. Who doesn’t?! It’s kid-friendly and you can put whatever toppings you like on them. We wanted to switch things up a bit, so I tried out a new recipe for the pizza sauce. Toppings of your choice. We flash fried a couple of chicken breasts with some light seasoning and diced them up. Chopped mushrooms, spinach, and of course, black olives (the kids favourite). Melt butter in a small saucepan over medium heat. Whisk in flour until no lumps remain. Gradually whisk in milk. Add salt, pepper, garlic and basil. Place the tortilla on a pizza pan or cookie sheet. Spread creamy garlic sauce over the entire surface of the tortilla. Add your toppings all over. Sprinkle with grated cheese. Bake for 8-10 minutes or until cheese is melted. Watch the edges of the tortilla so they don’t burn. Remove from oven and let cool for 2-3 minutes. Slice and sprinkle with freshly grated Parmesan cheese and/ or Sriracha sauce if you’d like to kick it up a notch! The kids gobbled up a half a pizza each! I’m definitely making this again! and our daughter has requested a shamrock-shaped pizza in celebration of St. Patrick’s Day next week. I prefer to make homemade pizza crust rather than get the store-bought, and frozen pizza is a big no-no in our house. We love to put our own toppings on our pizzas, especially black olives! We have two Olive Monsters in our house, so our pizzas are usually pretty smothered in those! Mix Yeast, hot water and sugar together and let sit for 10 minutes. Next add the oil and seasonings. After resting the dough, press out into your desired shape on a pre-greased pan. Top with sauce of your choice, this is a good one, and your favourite toppings. We like shredded chicken, salami and ham, peppers, onion, mushrooms, spinach, basil, loads of olives and a major amount of cheese! Put into a pre-heated, 400 deg F oven for 20 minutes. Let cool 5 minutes so the cheese settles down, then cut into slices. We like to drizzle ours with Valentina hot sauce or sriracha sauce and sprinkle with freshly grated Parmesan. What’s for dinner? Pizza made from the heart! I thought I’d make it easy for myself by having pizza for dinner. We had a bunch of produce in the fridge that I wanted to use up before it turned ugly. ‘Cause when Mommy’s hands are occupied kneading dough for eight minutes, this is again one of those opportune times for the kiddos to get at each other. 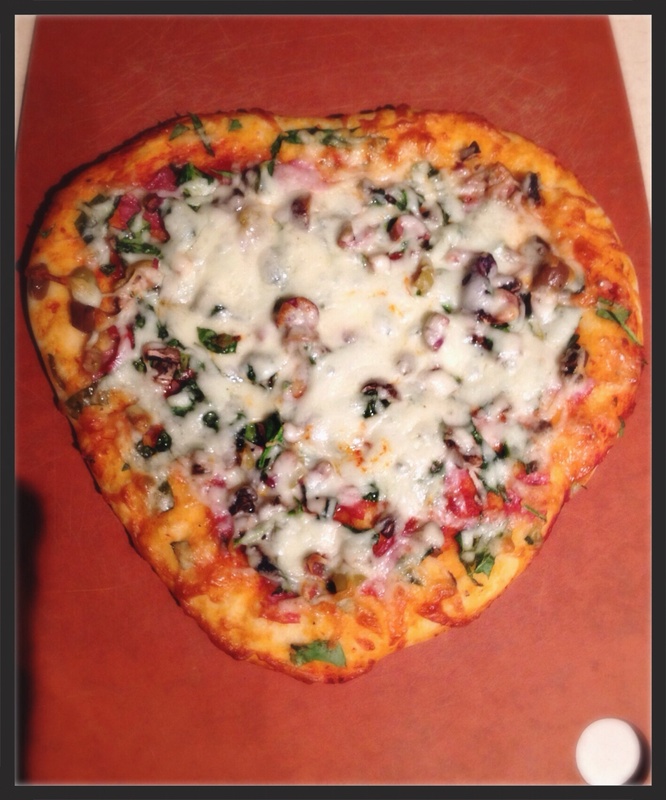 In celebration of Valentine’s Day, I lovingly made heart shaped pizzas. In bowl, combine 2-3/4 cups (675 mL) of the flour, yeast, salt and seasonings, if using. With wooden spoon, gradually stir in water and oil until ragged dough forms, using hands if necessary. Place in greased bowl, turning to grease all over. Cover with plastic wrap; let rise in warm draft-free place until doubled in bulk, about 1 hour. Once risen, turn out onto lightly greased pizza sheet and press out into a 14″ round. 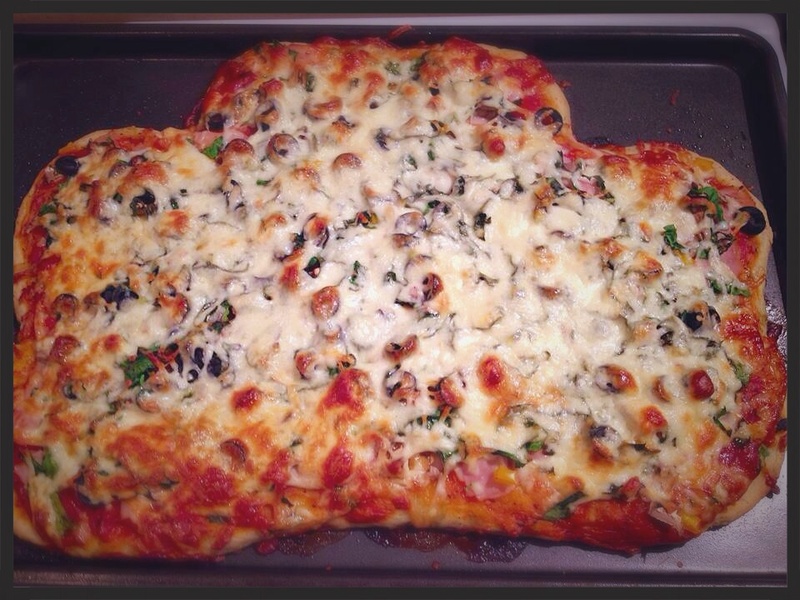 * I tore the dough in half so the kiddos could top their own pizzas and formed them into heart shapes in celebration of Valentine’s Day. 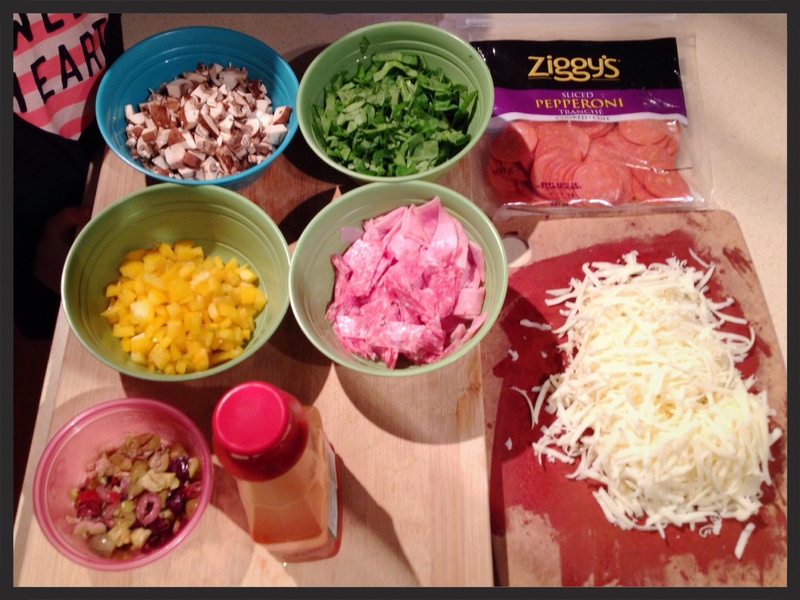 Top the pizzas with desired toppings of your choice, such as pizza sauce, meats, olives, peppers, spinach, basil, Boursin cheese, mushrooms, pineapple, etc., then smother in shredded cheese. Bake in a preheated 400F oven for 20 minutes or until the cheese is melted.